A simple paleo friendly sandwich - made from all natural wholesome ingredients. This sandwich will become your favorite meal! Make plantain bread. Take one whole plantain about 7-8 oz and blend into blender with 2 whole eggs. Pour batter into lightly greased (with coconut oil) circle baking pan at 350 degree oven for about 25 minutes. Once bread is cooked, remove from pan. 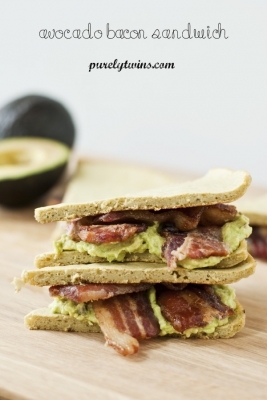 Layer with a mashed avocado and slices of bacon, about 4-6 slices of bacon. Or as much as you would like.